@joekamprad How can I remove it safely then? @joekamprad I found this in the package details. I think that the Antergos meta package needs it. Could I remove the dependency from the meta package so that it can be uninstalled? Notifies users when new antergos alerts are issued. @keegan Wow! The command worked! 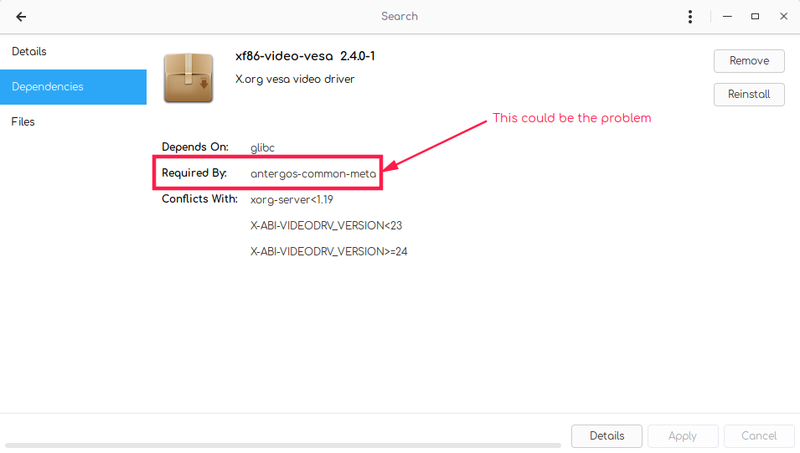 Should I also remove xf86-video-fbdev? Uninstall a package without checking existing package dependencies. Caution, this may affect the consistency and functionality of the system installation! So in this case it will NOT, but do not use -Rdd on a regulare uninstall!